Pres. Obama requested that Congress sit in a mixed group for this speech, and the members of Congress complied. Traditionally, the members sit with all Republicans on one side of the room and all Democrats on the other side. Then as the President says something favorable to one side or the other, that side of the room applauds while the other side sits in silence, grimaces, or crosses their arms. It's a silly tradition, which has no consitutional basis -- it's just the way it's been done. So Obama asked to change it on the grounds that it would feel less partisan and more united. It seems to have worked -- the audience did not have the two obvious partisan viewpoints, since the applauders and the grimacers were all mixed together. The members of the Supreme Court still sat in the front row, maintaining their poker faces as their tradition dictates. That tradition (also not in the Constitution) is to maintain their impartiality. But since we all know which side they're each on, it too is a silly tradition. 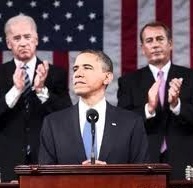 Maybe next year Obama will ask the Justices to applaud when they like something and to grimace when they don't. Mitt Romney: America needs less spending and more jobs. Barack Obama: Freeze annual domestic spending for next five years. Paul Ryan: FactCheck:Stimulus spending created between 1.4M & 3.6M jobs. Steve King: Obama's "investments" really just means "more spending". Paul Ryan: Stimulus spending spree created debt but few jobs. Barack Obama: OpEd: Poetic tales of small business ignore big monopolies. Barack Obama: Now business can write off the full cost of new investments. Barack Obama: Lower corporate tax rate; pay for it by closing loopholes. Barack Obama: OpEd: Study visas for foreigners means brain drain abroad. Barack Obama: Race to the Top: reward innovation in public schools. Barack Obama: FactCheck: Race to the Top has only rewarded 12 states. Barack Obama: OpEd: Sunlight & water into fuel? Share info with the world. Barack Obama: Subsidize clean energy by canceling oil subsidies. Barack Obama: FactCheck: clean coal isn't ready; nuke waste is unresolved. Michele Bachmann: American exceptionalism: indispensable nation of the world. Barack Obama: Double our exports by 2014; starting with South Korea. Barack Obama: FactCheck: Yes, exports up; but not enough to double by 2014. Paul Ryan: FactCheck: all-time high government was 1943, not 2009. Paul Ryan: Individual liberty requires limited government. Sarah Palin: Cut funding for "fluffery" like the NPR and NEA. Barack Obama: Repealing healthcare reform would cost $250B. Barack Obama: FactCheck: healthcare reform saves $2B to $10B, not $250B. Michele Bachmann: ObamaCare replaces finest system with government coverage. Michele Bachmann: FactCheck: pre-ObamaCare system was 49th, not best in world. Paul Ryan: FactCheck: costs go up just a bit; jobs go down just a bit. Paul Ryan: FactCheck: No evidence that healthcare reform explodes debt. Paul Ryan: Open-ended healthcare entitlement moves US toward bankruptcy. Barack Obama: OpEd: Selectively assassinated Iranian nuclear scientists. Barack Obama: New START treaty: more secure & fewer nuclear weapons. Barack Obama: Stop expelling talented undocumented workers. Michele Bachmann: $700B bailout & 9000 earmarks didn't keep unemployment at 8%. Michele Bachmann: FactCheck: bailout cost $25B, not $700B; and no IRS police. Barack Obama: Space-race-level investment in R&D; biotech; & green tech. Barack Obama: High-speed rail for 80% of US; high-speed web for 98% of US. Barack Obama: FactCheck: High-speed rail for 80% possible; but not soon. Sarah Palin: USSR won 1960s space race, but its debt led to USSR collapse. Barack Obama: We've taken the fight to al Qaeda in Afghanistan, until July. Barack Obama: Iraq: 100,000 troops have left; let's finish the job. The above quotations are from 2011 State of the Union address to Congress, plus the Republican Response and the Tea Party response: Jan. 25, 2011.